I got apples coming out the wazoo! I might have went a lil overboard last week at the apple orchard so this weekend, it’s my mission to use them up and create some awesome stuff. 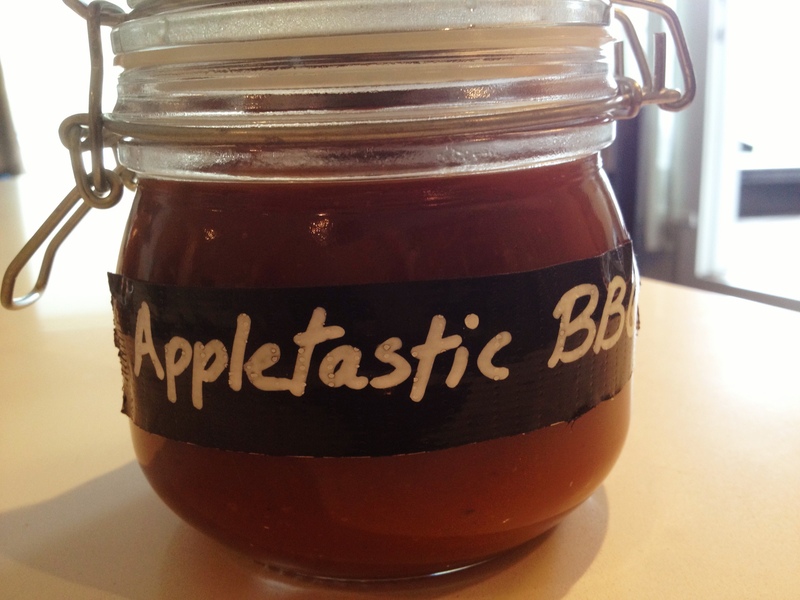 The other night I was brainstorming some appletastic recipes and then it came to me…BBQ with a badass apple flavour. YES! 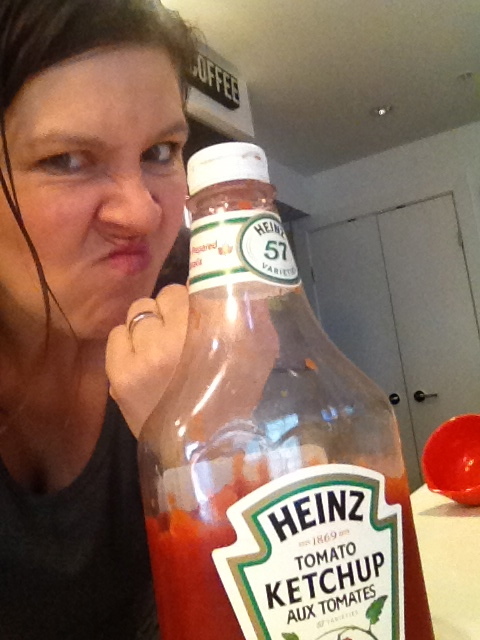 Okay so those of you that know me, know that I have this really weird disdain for condiments. Not all condiments but the stop light series really makes me want to harf!! Relish is seriously beyond me…I don’t understand what it offers to society? Mustard is just too yellow and Ketchup…well let’s just say there was an incident. The smell and the look have always somewhat frightened me. Most people find this bizarre and hilarious but honestly, it’s a problem. I’ve been learning to manage it, like not vom all over someone at a restaurant when they don’t follow the cardinal rule of my ketchup coping mechanisms. What is the cardinal rule you ask? Well, if we are out together at a restaurant and you must have ketchup with your fries, please for the love of pete…place a discreet blob off to the side and dip. If you do the full palm pat at the base of the bottom of the bottle and do a free for all pour all over your fries…I will most likely dine and dash. What the heck does this half to do with a bbq sauce recipe?? 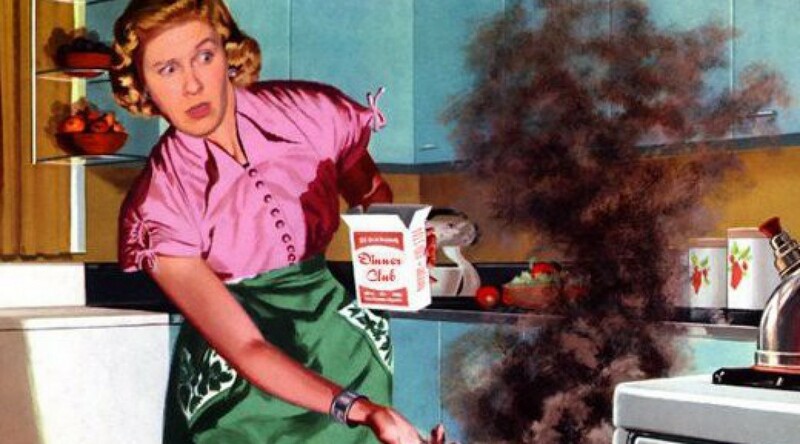 Well, most recipes call for adding some ketchup…YIKES!! Today, I’m going to step up and conquer this fear. The reason why my mood is ironic is because well…as luck would have it, the lion freaking LOVES ketchup. Shudder, Shudder, Shudder!! Yup, despite my best efforts of concealing ketchup from him, he discovered it and loves it. There have been times where I have had to have hubs step in after the lion has dipped his whole friggen hand in the stuff and no amount of baby wipes are going to take care of that. I have try my best to maintain composure and step away from the crime scene. Of course my kid loves my nemesis. Le sigh. Now because I can tolerate BBQ sauce, I often replace ketchup with BBQ sauce on the side of his plate and that seems to work and he equally likes that. I have come to the conclusion that kids just like to dip things and I need to just accept that condiments will be a part of this household. 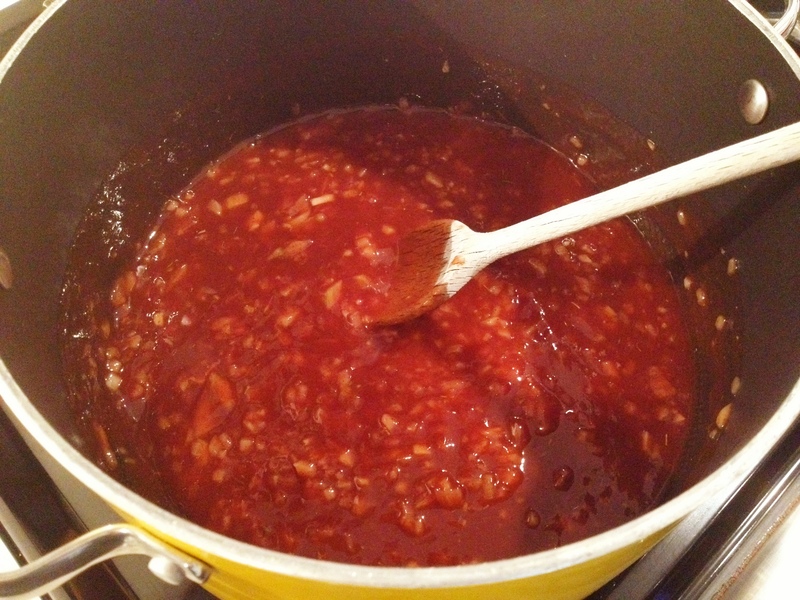 So now on to the Appletastic BBQ Sauce. First thing I did was preheat my oven to 400 degrees and then peeled and cored 3 apples, then cut them in to chunks and placed them in a roasting pan. 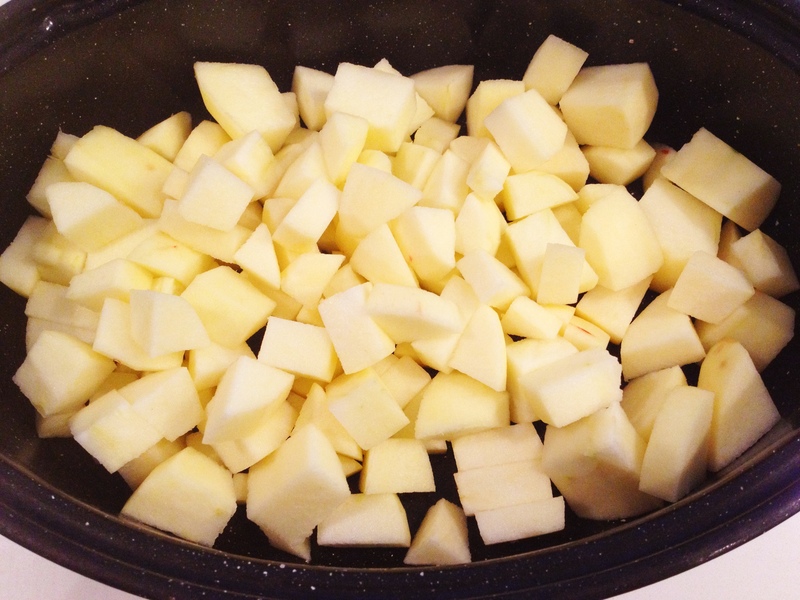 Let them roast for 20-30 minutes until they start to brown and caramelize. Here’s what the apples will look like. 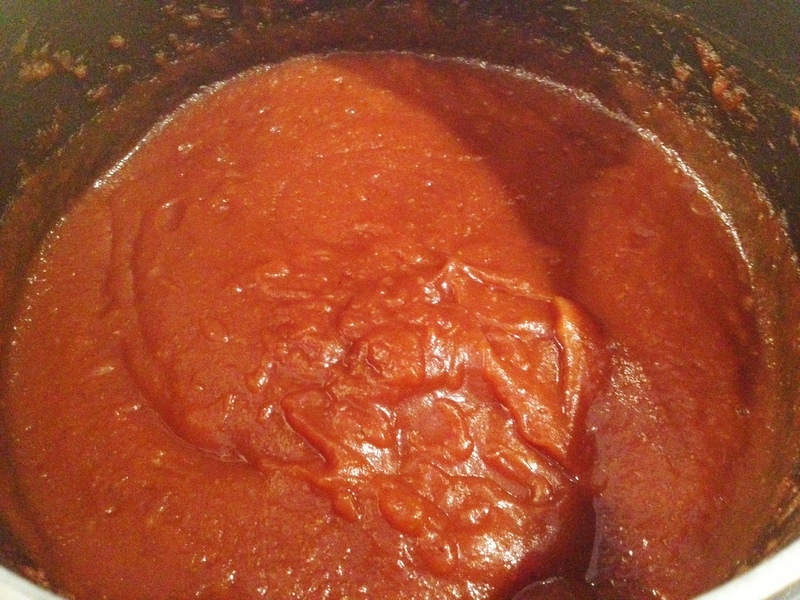 In a pot, place all of your other ingredients (even the ketchup), Onion, maple syrup, garlic, onion, salt, soy sauce, brown sugar, ancho chilli powder, apple butter, smoked paprika, cider vinegar, coffee, thyme, worcestershire sauce and cinnamon. 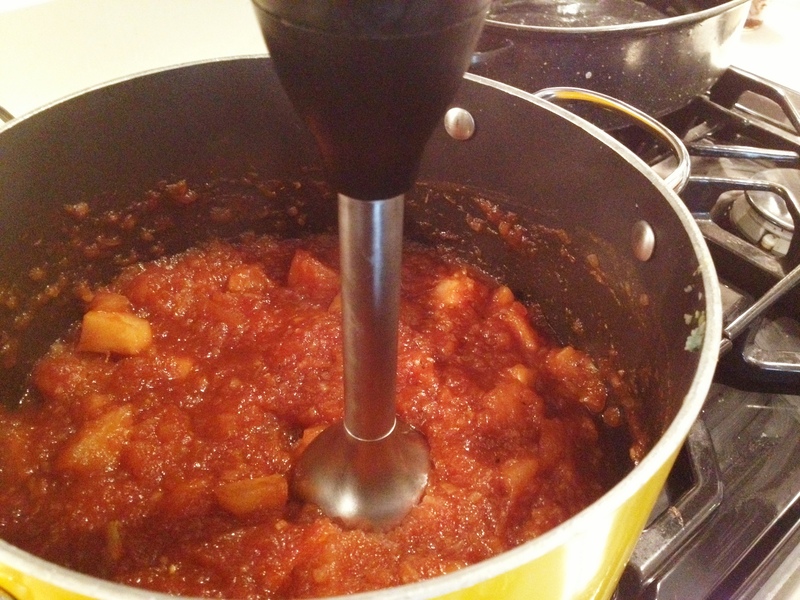 Once it has cooked, place your immersion blender in to the pot and blend until smooth and all of your apples and onions are chopped completely. Voila!! Hey…chicken and ribs just called they wanted to say thanks for the hot date!! 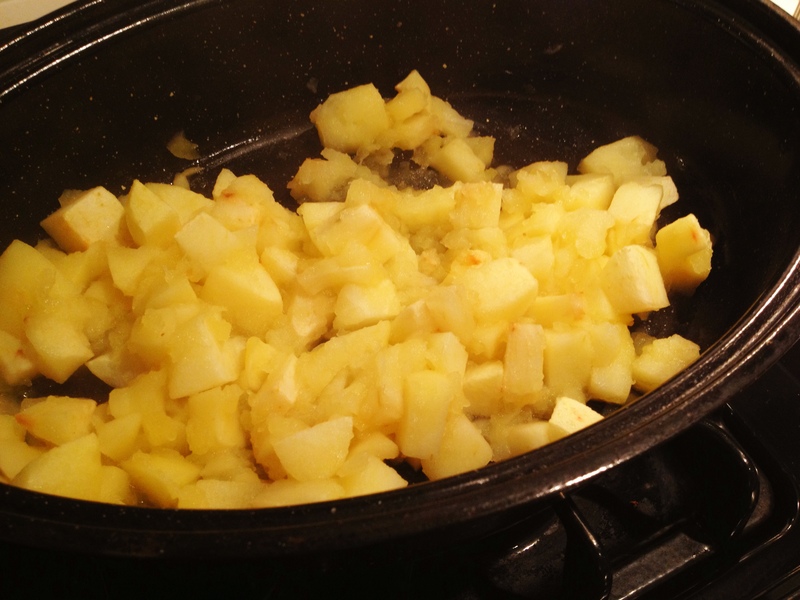 Roast your peeled apples in the oven at 400 degrees for about 20-30 minutes until they are slightly caramelized. Place all other ingredients in a pot and bring to a boil. 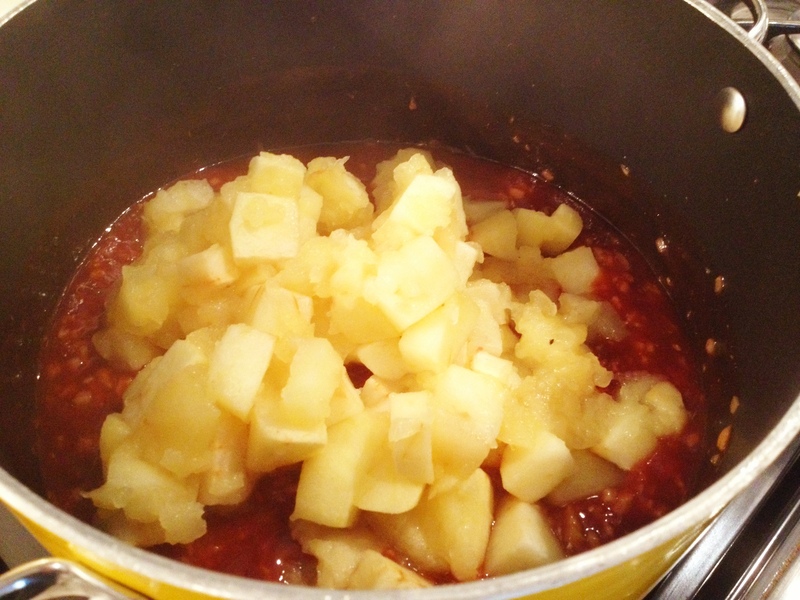 Add your apples, reduce the heat and simmer for about 30 minutes. Use a handblender directly in the pot to blend all ingredients until smooth. Or you can transfer to a blender. Put it in jars and place in your fridge until ready to use. *This sauce pairs really well with bbq chicken, ribs and pork tenderloin. YUM!! 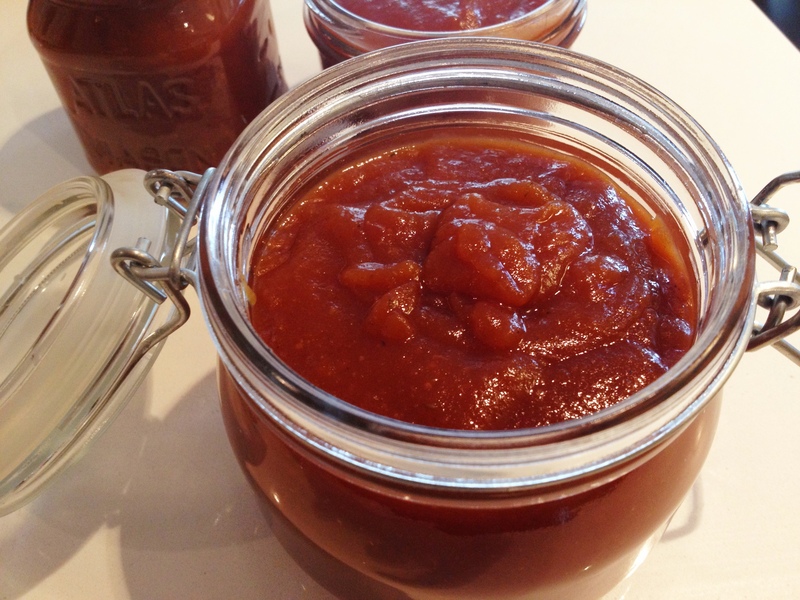 It’s a sweeter BBQ sauce with a bit of subtle smokiness and heat. I needed to make this toddler friendly so I was pretty restrained on the spice. 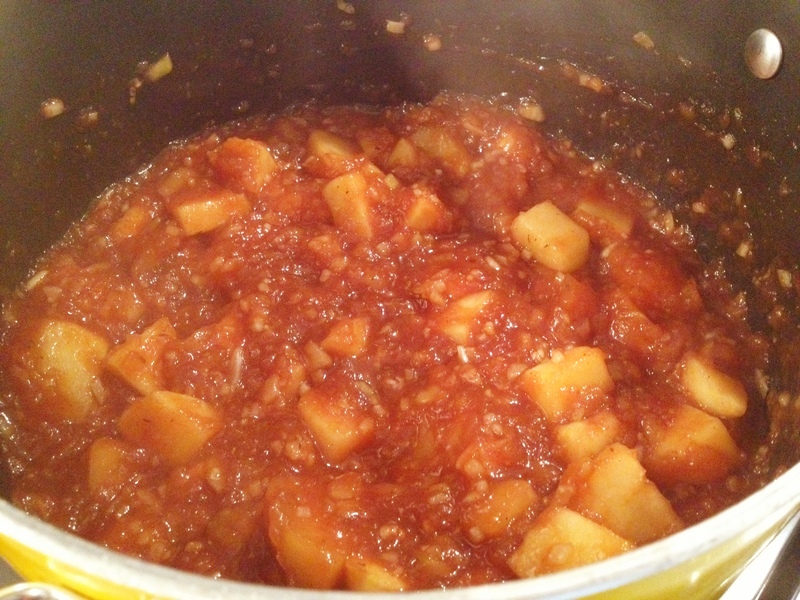 After just making your apple butter do you think this would work in the crockpot too???? I need to use the crock more! 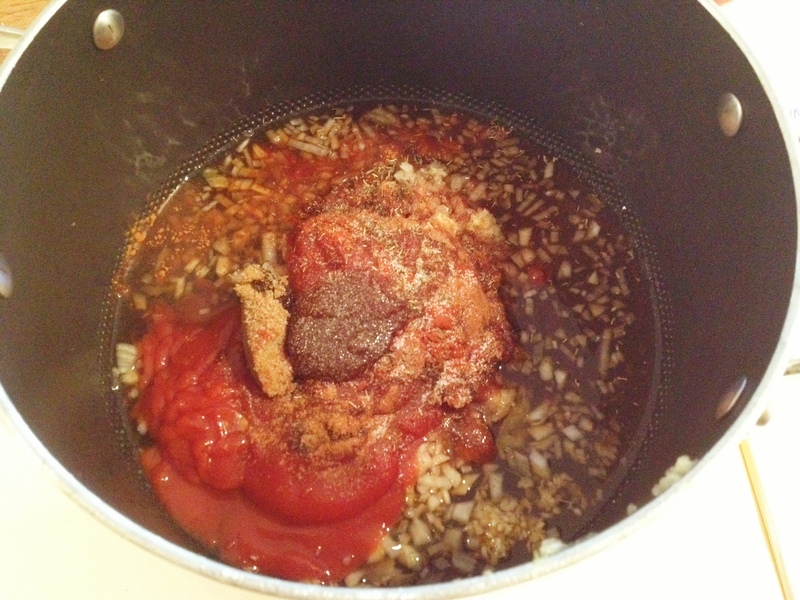 Yes, I think it would work in the crockpot…probably just take a bit longer if its on a low setting. As for the labels…get ready…its good ole duck tape and I have a white sharpie pen that is like a chalkboard pen. Clever right? ?